One of Britain’s most notorious gangsters, who was once dubbed “public enemy number one”, has died in jail. Wayne Hurren, 57, was serving a sentence for firearms offences after completing an earlier jail term for wounding three police officers and a string of armed robberies. He was found inside his cell at Wormwood Scrubs prison in west London on Saturday. The BBC understands Hurren killed himself. In 1996, Hurren, from Shoreditch, was charged with three murders, one of which it was alleged had been organised on a prison telephone. He was later cleared of those charges. 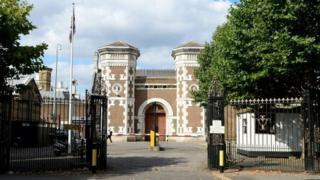 A Prison Service spokesman said: “HMP Wormwood Scrubs prisoner Wayne Hurren died in prison on 16 March 2019.